Advertising Age’s 14th Annual Hispanic Fact Pack is out and full of insights that will help you connect with the exploding Hispanic market. Here are the top facts you cannot miss before your embark on your next Hispanic marketing project. The Hispanic opportunity is here now and it’s time to market to the nation's largest minority in their own language. 22.8% Hispanics vs 12.3% general market used their mobile phone before, and during their shopping experience by calling a family member or friend for advice, or summoning online review sites and price comparisons. U.S. Hispanics like spreading the word on their purchases. They look up and write reviews through their mobile phone significantly more than general market: 28.9% Hispanic vs 16.8 of all adults looked up reviews before entering the store. 20.9% Hispanics vs 7.5% of all adults wrote reviews at check out. 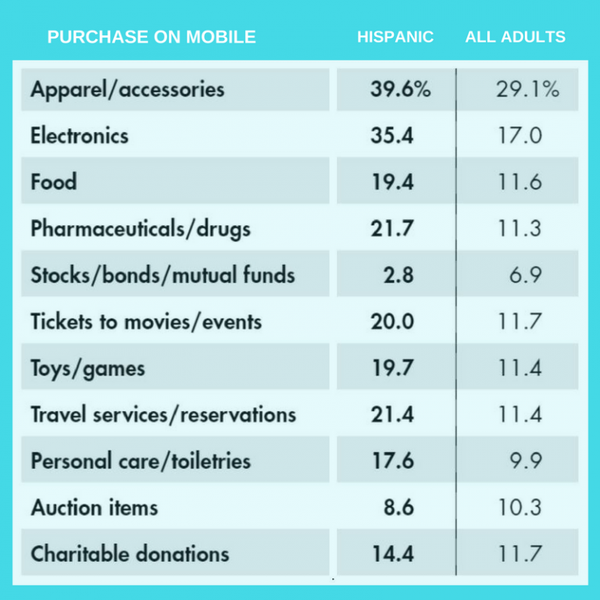 U.S. Hispanic cell phone use was significantly higher while shopping for every single category, from apparel, to food, to electronics, to tickets and toys. More U.S. Hispanics use mobile online video than non-Hispanics. Hispanics live on social platforms and when it comes to shopping, Hispanics turn to social to research, review and advocate for brands. What are you doing to take advantage of the Hispanic opportunity? Savvy brands are putting their money behind the Hispanic opportunity across industries including personal care, household products, pharmaceuticals, and telecommunications. The top companies investing in Hispanic media, invested a total of $368 ,million and include Procter and Gamble, Genomma Lab Internacional, AT&T, Loreal, Allstate, Honda, and Walt Disney Co among others. Whether your brand is big or small, understanding Hispanic demographics, reaching them via mobile, and engaging in social networks will undoubtedly push forward your marketing efforts to deliver growth.